Review posted January 20, 2019. Albert Whitman & Company, Chicago, 2016. 32 pages. I was recently asked what would make a good baby shower gift, if you didn’t want to buy a pink fluffy outfit. Naturally, being a librarian, I suggested a book. Next time I’m on the spot like that, I will think of this book. Yes, it’s designed to be a gift book and has a place for an inscription at the front. It’s designed to be read by a parent or doting relative to a small child. I’m resistant to such blatant design lures. But even I have to admit – this book is utterly adorable! is only kind of cute. Two kittens with a ball of yarn? A line of fuzzy yellow ducklings? Naturally, there are big-eyed, sweet pictures to accompany this catalog of cute creatures. 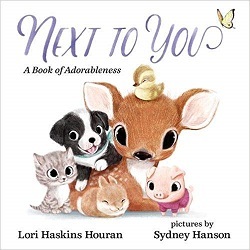 At the end, after saying all these critters are nothing next to you, the reader emphasizes that where they like to be is next to you, and we’ve got a cozy picture of all the adorable animals cuddled up next to each other. Grandmas, do you have the cutest grandchild ever? This book will be a lovely welcoming gift to read to them over and over again.